There are a lot of happy faces around Widen Media Collective since G2 Crowd's Best DAM Report gave us the highest overall customer satisfaction score this spring based on verified customer reviews, comparing Widen and 10 other digital asset management software vendors. Rankings will continue to be updated as the Grid℠ integrates information from current social data and verified customer reviews. You can follow G2 Crowd on LinkedIn and Twitter for more frequent updates. Over 200 crowd-sourced reviews, as well as data aggregated from online sources and social networks, were the basis of the G2 Crowd Grid report. Their review platform ranked products by analyzing their vendor market presence, using social and public data, as well as customer satisfaction reports. A five star rating was awarded by 88 percent of business and content professionals, including dedicated Widen customers proving to be models of Digital Asset Management (DAM) success. "We are so grateful to all our customers who shared their experiences on G2 Crowd and helped us top the DAM rankings ... Our company has evolved so much, over the past 67 years, and we're motivated to see that Media Collective has won the highest satisfaction scores of any vendor in our industry. This first Grid report is a testament to the vital role that DAM software plays in the modern marketing ecosystem," Matthew Gonnering, CEO of Widen. That’s really something to be proud of for a family-owned business, founded in 1948 as a plate engraver for local newspapers in Madison, Wisconsin. Obviously, old-fashioned values about customer service are still a big part of our business model. That’s what makes the Widen Media Collective a high performer in the DAM space, a smaller market than say CRM or marketing automation, but quickly becoming nearly as critical to marketing success. "Customer service, responsiveness, fantastic UI, free upgrades, competitive pricing, and a perfect mix of simplicity and granularity — all of these are strengths of the Widen Media Collective. They are world class in all aspects of DAM and DAM support," Corey Chimko, Digital Resources Coordinator at Cornell University Photography. Mix that with a healthy dose of innovation and agility, and you are sure to have a recipe for success, starting with the addition of prepress, printing and photography, moving through to 1995, when we released our first digital asset management software. Now, Widen has over 200,000 users in 179 countries, serving over 400 companies, meeting marketing, creative and visual content management needs across more than 30 different industries. Widen creates, manages, distributes and preserves creative assets for companies like: Trek Bicycle Corporation, Brady Corporation, Coty Beauty, Cornell University, Life Fitness, LG, and Carnival Cruise Lines. As of the end of March, 2015, Widen has attracted 7,646,000 lifetime logins, from 205,630 users. Together, they have interacted with 8,337,000 digital assets that have been repurposed 23,405,500 times. "Widen as a business is amazing to work with. Their team is extremely knowledgeable and is by your side every step of the way through implementation, as well as use after implementation. We have had our DAM through Widen for 10 years and have been extremely pleased with the relationship through the entire time. Their customer support is the best I've experienced both in my business life as well as my personal life. Simply superb each and every time I need them," Valerie DeCleene, Marketing Communications Graphic Designer at Brady Corporation. G2 Crowd describes Digital Asset Management tools, like Widen specializes in, as having powerful import and export functionality, to catalogue and maintain repositories of media files. The system organizes photos, audio and video files to maximum efficiency, working in tandem with other content management technologies like those in G2 Crowd’s Content Management category and Web Content Management subcategory. Optimized for processing speed and automatic transformation of files to different file types and/or sizes, DAM tools include versioning, preview and thumbnail views. 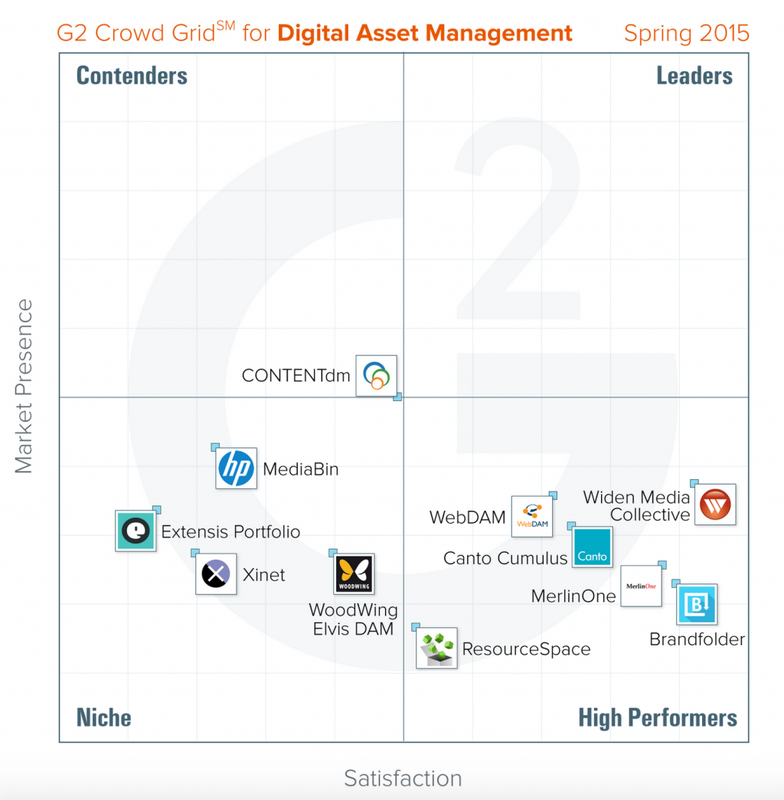 Request a demo to get a first-hand look at Widen’s top-ranked digital asset management solutions.